this bourbon apple cider cocktail. so perfect. this idea of a pie sundae social. what the what? this tart cherry mint iced tea. dreamy. this rainbow birthday cake. wow! this grilled cheese eggs benny. i really can’t. blown away. these salted caramel crunch blondies. ohemgee. these bacon wrapped grilled peaches with balsamic. holy cow. this sea salted buttercream on a chocolate cupcake. uh huh. 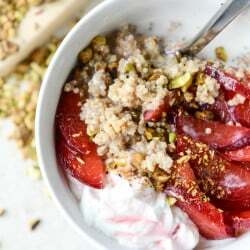 this creamy coconut millet porridge. yessss. this chai tea ice box cake. !!!! this roast pumpkin salad with raw macadamia hummus. amazing. this matcha mint chip shake. pretty. this strawberry shrub cocktail. love. these baked stuffed sweet potatoes. so good. this bittersweet chocolate bourbon tart. whoa. this roasted tomato basil grilled cheese. lovely! this frozen almond spiced chai. i want. this wine battered coconut shrimp. gah. this black sticky rice with pomegranate + passionfruit. stunning. this matcha marble poundcake. ahhhh! this baked brioche with pistachio creme, honey and figs. seriously dead. 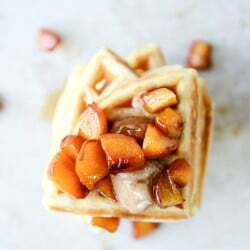 Vanilla Yeasted Waffles with Roasted Peach Maple Syrup. Bacon wrapped peaches? Oh my. YUMMMMMM. That grilled cheese egg benny looks wicked. Congrats on the cookbook! Placing my order today. I really want to do this, though maybe not with meatballs because tbh I kind of hate making them. Touching raw meat…ack. Rachel, thank you for linking to that story. That’s the sort of tradition I want to start. i love that story. I”m working on starting up a Taco Tuesday in the same fashion. I think it’s such a wonderful tradition. Thanks for the link love, you lovely lady you! Just ordered your cookbook off Amazon — exciteeedddd! Love the list but more wanted to tell you just how much I’m loving reading through your book. The photos are gorgeous, the narrative is perfect, like I’m actually having a conversation about a recipe you’re recommending. I want to make everything….but i have a raging sweet tooth so clearly a dessert will be up first. Thank you for this great addition to my cookbook collection (read addiction). Can’t wait to catch you in person at a signing. What a delicious list of goodies! So many yummy things! Going to make those stuffed sweet potatoes tonight! And I really want that frozen almond spiced chai!! I have been waiting for a recipe to use my matcha! I need to try that poundcake! Love reading your “Crushing On” lists! I get so many great ideas and end up stumbling into blogs I haven’t seen before. One recipe I’m currently crushing on, that I came across lately on The Pioneer Woman’s blog, is for Lemon Lime Pound Cake. I’m looking to use my pretty, new bundt can pan and need to make a dessert for a girlfriend get-together next Friday. Think this will end up being the treat I whip up! On another note, about to dive into making your Bacon Beer Cornbread, to eat up with the inaugural fall chili batch. Thanks for posting and for giving my husband and I inspiration to dive into new foods and recipes in the kitchen! So many delish things this week. .I want them all. This post always makes me so hungry. I just bought your book at Barnes & Noble. I love it so much. Your photography is fantastic and all of the recipes are so drool-worthy. Can’t wait to make them all. Wishing you so much good luck with your book. These lists slay me. The Mediterranean Bostock from Gabe is next level creativity and delicious. Bacon wrapped peaches, where have they been all my life? And GOOD LORD, that salty buttercream? Crazy. Thanks for the mention, Jess! Wine battered coconut shrimp – I am in heaven! What I am currently crushing on: your cookbook!!! I got back from a trip today and found it waiting for me. I just spent an awesome 90 minutes looking/drooling through it, and I think I want to try the slow cooker short rib breakfast hash first. The photos are gorgeous and it’s such a fun read. I can’t wait to start cooking from it. YAY! That brioche!!! Also, I totally drooled over that sticky rice earlier this week. So many amazing links.Thank you for including me in them! Hope you’re having an amazing time on the tour, so proud of you. The pie social – SWOON. Too cute! Our church had a pie social yesterday. My kids LOVE them and I feel all Laura Ingalls when we have them. Wait! I’m the mom…I guess I feel all Caroline Ingalls now. I absolutely love these posts! I’m sure it takes a good amount of time to compile these lists, just wanted you to know that I always look forward to them. Thank you!! I got my Seriously Delish before I left for Vegas last week but just got time to sit down and flip through cover to cover. So good. Congratulations!